The life journey of Alice Erickson Cox was long, far and wonderful – 97 years with thousands and thousands of miles traveled. Though she demurred at praise, her life was filled with countless contributions to make our world a better place. The Willmar Area Community Foundation remembers Alice for her generosity. She died Dec. 29, 2011 at the Rice Memorial Hospital in Willmar, just a couple months after being formally recognized for her impact in the Willmar area. 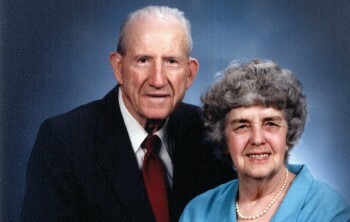 The Foundation honored Alice and her late husband, Joe, in October with the 2011 Award in Philanthropy. "Alice was an inspiration," WACF Director Dean Anderson said. "She was a woman of faith, grace and humility who believed in "an attitude of gratitude. Alice shared her good fortune with others, and our community has benefited greatly. She will be missed by all who knew her." From her humble beginnings in Lake Lillian, Minnesota, to her many travels across almost every continent to her return to Willmar in 2004, Alice embodied an adventurous spirit and a generous heart. Both she shared with Joe. They married after meeting in a supper club. It was while working in the logging industry that Joe wondered how a simple beetle could cut through wood so fast. Joe viewed a beetle under a microscope and invented and patented the chain for chain saws, based on the beetle’s technique. She was a contributor to many organizations, including Rice Memorial Hospital, Safe Avenues, YMCA, Lake Lillian United Lutheran Church, Calvary Lutheran Church, and Community Christian School.